Want to bring the beauty and tranquility of a saltwater aquarium to your place of business? Triad Reef Critters offers a wide selection of aquarium styles and size to fit any environment. From waiting areas to lobby spaces, our fixed price monthly fee offers an easy solution to enjoying the peace of the ocean with minimal upfront expense and no maintenance responsibilities. Need an aquarium moved? Whether it is across the room or to a location miles away, Triad Reef Critters can help. Our professional team will safely transfer your equipment and livestock. Our 100% Arrive Alive Guarantee assures you that your livestock will be safely cared for throughout the move day to its new home, or we will replace it at no charge. Call for a quote or more information. Issues with your aquarium are not always planned. 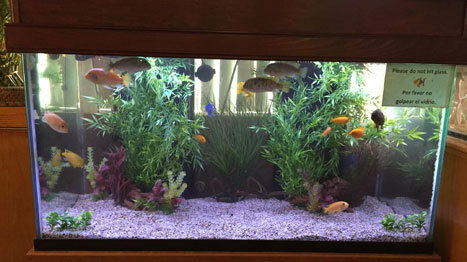 Triad Reef Critters is your on-call emergency fish and tank doctor. If there is disease outbreak, equipment failure, a tank leak, or anything that can put your tank at risk, we can help. Our goal is to keep your tank safe, secure, and healthy to ensure your continued success and enjoyment in the saltwater hobby. Sometimes you just need some advice or maybe a one-time visit to check the health of your aquarium inhabitants. A member of our experienced service team can come to your home or business and check the equipment, test parameters, and give you a refresher course on how to care for your aquarium, or assess your fish health and water quality. Let us help make your aquarium the best it can be. Call for more information.